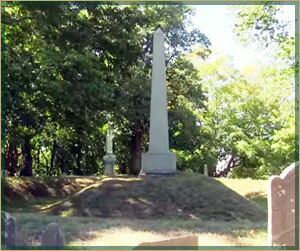 Adjacent to historic Hingham Square lie 13 acres of open parkland — rolling hills and terraces known as Hingham Cemetery. Established over 340 years ago c. 1672, the privately-owned cemetery is the resting place of numerous state and national patriots, statesmen, militia, and townspeople who helped build and shape our country. It is one of the few historical cemeteries with lots still available for sale. The grounds also encompass Hingham’s only Veterans’ burial area, its only arboretum, and a Memorial Garden for cremations. Two town-owned monuments (the Settler’s Monument seen on the town seal, and the Civil War obelisk) are located in the cemetery. The site also contains many colonial slate headstones, some credited to noted headstone carvers of the 17th and 18th centuries, as well as Victorian artwork by three major American sculptors of the 19th century. A professional landscape crew helps maintain the grounds to insure that the lawns and gardens remain attractive to family and friends. We encourage visitors to enjoy the grounds, trees, and monuments in this quiet, contemplative setting one block from Hingham Square. School groups, researchers and visitors from around the globe visit year round. Run by a group of dedicated, unpaid volunteer Board of Directors, Hingham Cemetery is a non-profit, non-sectarian organization serving the town of Hingham. Our emphasis today is not only the renewal of the 175-yr-old arboretum and the Colonial and Victorian areas, but also the incorporation of our newer Water Street area. The Hingham Cemetery Corporation is managed by an all-volunteer Board of Directors supported in large part through contributions to Friends of Hingham Cemetery. 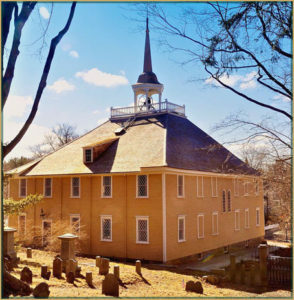 Old Derby ~ 34 Main St.
As was customary in England at the time of early settlement, the dead were buried around the meeting house, the first being approximately where Old Derby stands today (34 Main St.) and the second being the Old Ship Church (107 Main St.). The property behind these meeting houses was privately-owned farmland and changed hands many times over the next 150 years, yet tradition holds that burials continued “among the grazing farm animals.” We know this practice continued until about the time the cemetery was incorporated in 1838. Old Ship Church ~ 107 Main St.
To give credence to the importance of this newly-planned cemetery, the town of Hingham erected its Settlers’ Monument (1839) there on the historic site of the town fort erected during King Philip’s War. In a sarcophagus under the Monument lie the remains of Hingham’s early settlers who were disinterred when Main Street was lowered to accommodate horse-drawn trolleys. Surrounding the base of the Settlers’ Monument are many of the old slate colonial markers that were rescued from the Main St. dig. It is interesting to note that the Settlers’ Monument was selected, along with the Old Ship Meeting House, as the most revered symbols of the town, and were incorporated into Hingham’s legal emblem, the town seal. The esteem held by Hingham Cemetery is also exemplified by erection of the Soldiers’ and Sailors’ Monument (Civil War Monument) in 1870 – a Town-owned monument placed on private property. The obelisk is made of Quincy granite, stands 30 feet high, and is inscribed with the names of the Hingham men who died in the Civil War. In close proximity is the Thomas Gould statue and gravesite of Gov. John Andrew, civil war leader and driving force behind the 54th Massachusetts “black” regiment (See the Hollywood movie production “Glory.”) Of particular poignancy, however, is the nearby headstone of Peter Ourish, Hingham’s youngest volunteer in the Civil War. Peter signed up at 16, fought in 15 major battles including Gettysburg, Second Bull Run, and Fredericksburg, only to die of wounds in a Washington hospital 3 years later at age 19. The site of this impressive Civil War monument, on a high hill again overlooking the harbor, was an ideal location for much-needed new gravesites, and in 1994 the town’s only Veterans’ burial ground was opened. Only flush government-issued markers are permitted in keeping with the original landscape design of 1870. In 1886, the cemetery chapel was erected. 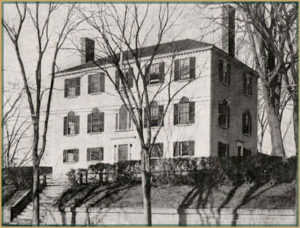 It was designed in the then-popular Queen Anne style by J. Sumner Fowler of Hingham and was originally topped with an elaborate cupola. Funds were raised by subscription over 10 years. Its main purpose was to accommodate out-of-town families, which were many, with a place for burial services. The window in the chapel was given by friends of Annie F. Ames, daughter of the prominent Hingham merchant Luther J. Barnes, who had died 10 years earlier. Electricity and a telephone were installed in 1929. However, by mid-century, out-of-town descendants were no longer returning to Hingham, and the directors’ meetings dealt often with the deteriorating condition of the unused chapel. By 1977 there was even consideration of tearing or burning it down. 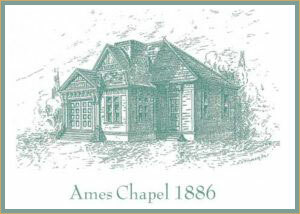 However, the Ames Chapel has now been extensively restored. By the early 1900’s craftsmen of hand-carved monuments were starting to disappear as machine cutting became faster and cheaper; headstones became smaller and more generic as money became scarce. However, the large Receiving Tomb opposite the chapel was erected in 1916 and a potters’ field was established in 1928. As public interest in the cemetery waned, the burial ground went into a decline and became a little-known and forgotten entity to townspeople. It was often misidentified as the Old Ship Cemetery, and considered historic and no longer active. Daily visitors were few, lot sales declined and vandalism was a persistent problem. The Cemetery acquired one last piece of property in 1948, when the Town filled in the old Mill Pond to create Station Street with fill dredged from Hingham harbor. The portion of the pond to the south of the railroad was deeded to the cemetery and became known as the Water St. section, which was not developed for gravesites until 1985. In 1989, a new board of enthusiastic directors (and the first two women in its 150 years of incorporation) was installed, and a restoration program was begun. Over the next 10 years roads were repaired, trees pruned and replanted, headstones cleaned and restored, publicity articles written and historical tours started, sales brochures produced and records put on computer with a website link. Two new burial areas were opened within 6 years: the town’s only Veterans’ burial ground (see above) and in 2000, a Memorial Garden for in-ground burial of cremated ashes among flowering dogwoods and azaleas. Further gravesites were established in 2007 paralleling Water St. alongside the Memorial Garden. The effect of this restoration program resulted in substantially eliminating vandalism, notably increasing lot sales, and filling the grounds with walkers and visitors. The public once again has taken interest in the cemetery as a park, cemetery, arboretum and important historic site. 1838: Land bought by Adam Thaxter from Thomas Loud and donated by him for the purpose of establishing a cemetery. Hingham Cemetery was incorporated on February 28. Modeled after Mt. Auburn Cemetery, Cambridge, MA. 1839: Settlers’ Monument. 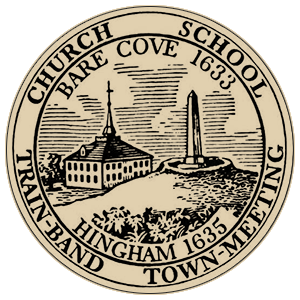 Depicted on Hingham town seal. 1949: Water St. land given by town after filling in mill pond with dredging material from harbor. Our objective is to offer the people of Hingham and their families burial grounds and services consistent with the Town’s environment and the Cemetery’s beautiful setting. Cemetery tours describing history, social times, monument icons, important burials, etc. are given twice a year or by request. The Board of Directors of Hingham Cemetery is dedicated to the maintenance, restoration, and perpetuation of the grounds and monuments of its historic burial place. Our objective is to offer the people of Hingham and their families burial grounds and services consistent with the Town’s environment and the Cemetery’s beautiful setting. 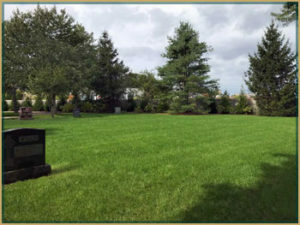 Preserving and maintaining the unique arboretum style of our cemetery while simultaneously developing and improving new sites and areas in a financially responsible manner is our commitment to our past and future. The need to serve our lot holders, funeral directors, clergy, and the general public. The importance of our role as a neighbor in the community, and the importance of encouraging broader use and enjoyment of the grounds and facilities consistent with their peaceful setting. Our responsibility to provide our staff with an environment that contributes to their well-being and that is conducive to communication, mutual respect, and the development of their skills. Hingham Cemetery is one of the few historical cemeteries in the United States with burial lots still available for purchase.